FiberMark had a collection of videos they used in trade shows and sales meetings, but the iPad videos app wasn’t well suited to these environments. We developed a custom video player that made it easy for FiberMark’s users to instantly access the videos they wanted to share. One of the most compelling ways that FiberMark demonstrates the capabilities of their materials is to showcase finished goods made with them. FiberMark selected a particular item to start with (the case that Remy Martin Louis XIII is sold in), and we performed a 360º photo shoot, which we then built into an interactive 3D model of the case. For each of FiberMark’s product lines, they produced a swatchbook containing samples of all the colors and textures available. Taken together, these swatchbooks could fill a bookshelf, or the entire trunk of a car. 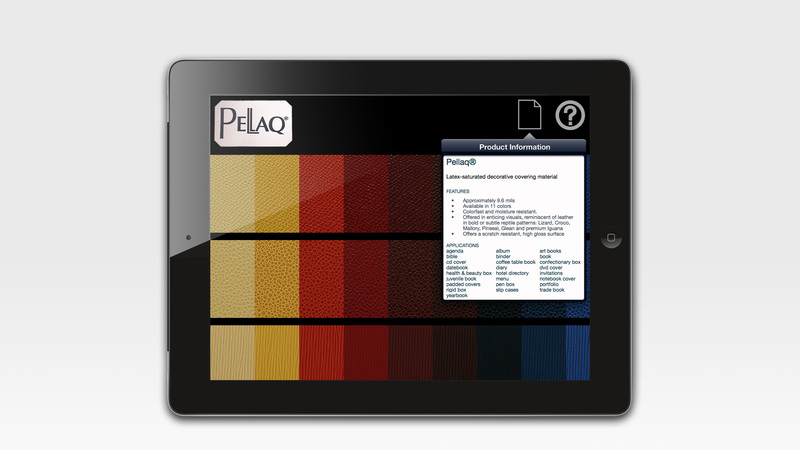 We investigated replacing these physical swatchbooks with digital stand-ins, selecting as our pilot case FiberMark’s most expansive product line, Pellaq, which contained six distinctive textures (from leather to snakeskin to crocodile and more) in dozens of colors and patterns. To demonstrate the unique characteristics of these materials, simple photography wouldn’t suffice. We again did 360º photography, but included multiple sets of photos capturing the material illuminated at different angles. We used these photos to build a 3D model for each variation of the Pellaq material, and we developed an app that used the iPad’s accelerometers to detect the orientation of the iPad in real space. This way, we were able to produce interactive visuals that mimicked the appearance of the physical material, including real-time reflections and shadows, as the user holding the iPad tilted and rotated the device. These initial pilot apps were an immediate hit with FiberMark’s staff and customers, so they quickly came back to us for an expanded offering. We developed several more interactive 360º apps showing off finished goods, as well as new swatchbook apps for a diverse collection of product lines. We also developed a new kind of app for them, one that showcased finished goods made from materials in every market segment they serviced. This app included novel spatial navigation, showing off photos of hundreds of items, using a custom automated layout system and sophisticated filtering to help highlight offerings that would be most relevant to any particular customer. At this time FiberMark was also undertaking a migration from Blackberry devices to iPhones for their staff. In order to fully leverage this investment, we created new iPhone versions of many of the iPad apps we had developed for them. "Thanks for update... and all your help in getting the Apps to the agents this week. They were VERY excited about what they saw and definitely eager to get the Pellaq and Public FACES and COLORS apps installed." Based on the enthusiastic internal response to these apps, FiberMark decided to roll them out mor broadly. Our first external audience consisted of authorized resellers outside of the United States. FiberMark was concerned about protecting their intellectual property, and wanted to be sure that their apps only ran on authorized hardware. In order to provide this assurance, we developed a custom security solution that prevented apps from being copied to new devices via backups without explicit authorization using an easily managed challenge-response system that communicated with FiberMark IT at their global headquarters. Finally, we worked with FiberMark to develop a few new apps that were released to the general public through the App Store. The most interesting of these was their “Colors” app. We worked with FiberMark’s web developers to integrate visual swatches of every single product in FiberMark’s catalog, and we presented them in the app using a CoverFlow-style interface for casual, engaging experience browsing their offerings.